I was walking down stairs to get clothes for Lydia. She has finally grown into 2T clothes. Something we thought she would never do. She had pictures in two days and I knew that there were more clothes somewhere. After all, she is our third girl! I imagined a puffy tutu dress and a pretty color that would make her eyes sparkle. As I approached the bins downstairs, I saw that there were two large 2T totes. Surely there had to be something in there. I picked one up and lugged it back up the stairs. All of the girls were eating and I sat in the living room to go through it, without any help! I opened it up and I saw two T-Shirts and tears immediately started running down my cheeks. I was over come with emotions and it seemed as though time had stood still. It seemed as though I completely loss track of how fast the years went by. And there was a sudden chill that overtook my body, I don't remember those years. They were two T-Shirts that said Children's Hospital of Wisconsin on them. One was yellow and the other one was orange. My husband and I purchased them for Ellen and Allison the day I was discharged after one of the most horrific days in my life. I will never forget it. It was July 6, 2011. It was one day after my husband's birthday and also one day after our ultrasound that detected an extreme amount of amniotic fluid around our precious baby. We never waited for the referral, we had to get to see the perinatologist as soon as we could. We must find out what is wrong with our baby. To our surprise, we were able to get into the doctor the very next day. Ellen and Allison went to stay with Eric's parents so we could focus on the news that we would find out. But nothing, nothing, quite prepared us for what we were about to endure. Within moments of meeting my new doctor, we learned that our baby had a heart defect (AV Canal) and there was no stomach that they could detect. They also suggested that I should have an amniotic reduction and one of the side effects would be that I could meet my baby that night. Ugh! After prayer and council with very good people (mom's and Pastor's and friends) I under went the reduction. I was in labor for over eight hours. I was sick and they were trying to stop labor. The next morning my eyes were so red and burned from crying literally all night long. I knew God had a plan, but I was not ready to take this journey. I knew that I should trust, but I was really fighting this new. 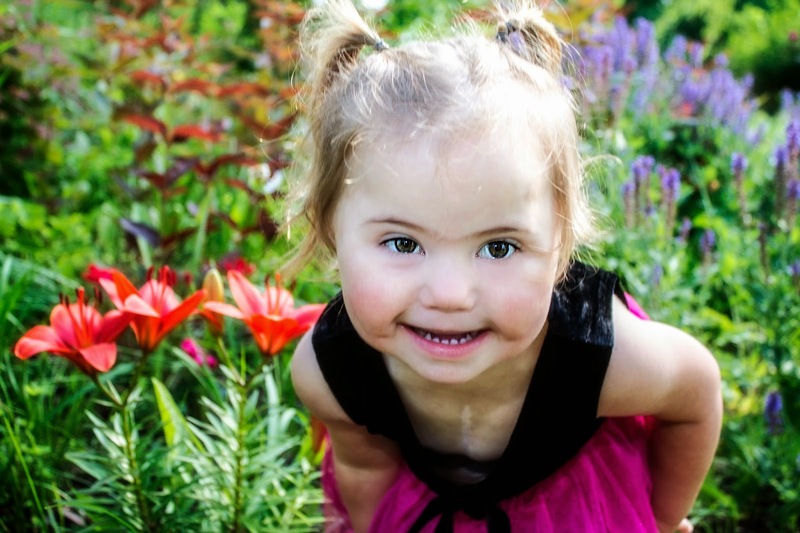 Down syndrome we were prepared for, but not for these medical issues. We were actually super excited to welcome a little one with Down syndrome, but to have to watch our baby fight for their life, we were not prepared for that. They wheeled me down to the Herma Heart Center where we would get a fetal echo done. I sat in the same waiting room that we sit today when we go for her heart check ups. I was a complete mess. Whenever I see a mom, who is in that ugly hospital gown, red burning eyes, rubbing their stomach as almost grasping and the growing life in their belly, I want to give them a hug and say it will be alright. I remember when they came in and told me we were having a girl. I could not comprehend. In fact, she had to repeat it to me several times. I just could not process one more thing. I was pretty much convinced we were having a boy this time. But to my surprise and joy, we would be welcoming another girl. A girl who would have Down syndrome, a girl who would have to fight for her life. A girl who would change me as a mom, a person, a wife, a Christian, a daughter; change me entirely. (We also learned in fact, our little girl would have Down syndrome...it was suspected until this point, but not confirmed). As they discharged me, they handed me a sheet with my next appointments. They said we will see you next week; this is going to become your new home away from home. I never knew how true those words would be until the coming months. As we walked off the unit I just held my stomach in the wheelchair and cried. As we passed the gift shop, I had my husband pull me in. I knew we were going to have to tell our girls. How could we prepare them? How would they handle it? I wanted to buy them anything to just make this all go away. That is the very day, we picked up those two shirts. We thought they may enjoy them. Ellen's only fit for a bit so she handed it down to Allison who was thrilled to have it. She literally wore one of those shirts every single day. They had the blue babies on it, the bigger one was her and the smaller one was her sister Lydia; the little sister she would watch over and protect she would tell us. She wore it proudly! As I grabbed the T-Shirt out of the tote the tears started to flow harder and harder. I could picture Allison in that shirt. I could see her beautiful blue eyes and her long blonde hair that would just wisp over the shoulders of the shirt. I remember that smile she always had. I remembered the tears that she had too when she had to say bye to mom for yet another night. I remember her begging and pleading with me to just stay one more minute. I also remember what a great big sister she was, that even though it was so hard, she would do it anyways. I sat there wrapped in my emotions. I sat there sobbing now using the shirt to dry all of my fallen tears. Allison spoke up and said, mom do you remember when we went to the Children's Museum in that shirt and we worked on the cars. Mom do you remember that was the shirt I wore when I went into the salty pool and did not like it. Mom do you remember I wore that shirt at music therapy. Mom that was the shirt I use to wear when I helped in Ellen's classroom. Mom do you remember when I wore that shirt to the Brewer's Game? No. No, I do not remember any of that! How can that be? How can she be three years older? How could I have missed so much? That moment is frozen in time. That image is pasted into my head. I remember so vividly the memories and images of getting that shirt. Of giving that shirt to them and telling them all about their new sister. I even remember Ellen and Allison both wearing their shirt when they picked out their sister's name...Lydia Ann. I don't remember those things. I am her mom, I am suppose to. How could this be? There was a memory that was frozen still in time. I remember her being three years old, carefree and my little baby. I remember her just starting to learn many new skills and being mommy's little girl. I looked over at her and there she was, the starting of a big girl. Her features on her face developed so much more, her vocabulary amazing, her memories so much more than I have, her smile that can melt my heart. When did she grow up? How did she grow up? And how have I missed all of this. The tears kept flowing as I kept digging. That moment became frozen even more so. There was the dress that Allison wore the first time she came to see her baby sister. Her eyes lit up and made the room so amazing. How can it be that I don't remember three years of life? I just saw Allison wearing the same dress and now we are ready to hand it over to Lydia. And where did it come from? I never bought it for her? As Allison filled me in, her aunt gave it to her because she was growing, mom was busy and Allison needed clothes. Just a simple piece of clothing that brought me to tears. It made me realize how much I have missed. I didn't want to. If things went according to my plan, I would have been a very active participant in Allison's life during those times. I was presence in physical body, but emotionally I was completely attached to my daughter who lay in a hospital bed fighting for her life. I was flooded with such sadness. I was taken back with what this all meant. I need to get those memories and unfreeze them. That is just not possible. I cannot travel back in time. I cannot undo the past. But then I was reminded of this beautiful girl that was sitting at the table calling me mom. I had done just as God wanted me to do. God placed grandma's and Ronald McDonald Jessica's and Lynda's and Tiffany's, Aunts and Uncles, friends, and brothers and sisters in Christ to help when God said you needed to be with this child. And because of that, we are able to pass this clothing on to their sister. I realized in that moment, I was doing just as God wanted me to do, no matter how hard it was. That moment will always be frozen in time for me. I am sure each time that Lydia wears a piece of clothing a part of me will ache. It is something that I can't quite explain. I missed a lot with my kids, but we are a complete family now because of those sacrifices. We are different people because of the journey we were chosen to walk. We are a strong family unit. So with each piece of clothing we pick up that I feel like a moment that stands frozen, I will remember that we are stronger, we are better, we have Lydia because of it. I will try not to remember the rough stuff, the horrible things we endured, but I will celebrate how far we have come, I will praise God for the things He taught us and how far He has brought all of us. I will rejoice that my daughters have memories in those shirts that are good and that time never stood still for them. And, by the way, I was able to find a perfect dress for pictures. It was actually a dress that neither of my other girls wore, but one that my nieces wore. It was perfect for her! Often times we write about the bad, the things that happen that just are not right. I think that I do because I have these feelings that consume me and I need an outlet to get them out. That is usually why I write. However, last night I experienced something that was so touching to me and I just have to get it out. I am so excited to be writing about something that is so positive, I just have a smile from ear to ear as I relive this moving moment. Last night my family, along with my parents, went out to celebrate my birthday. I chose to go to the Backyard Bar and Grill because I enjoy their ribs. We walked in and were greeted as usual (I think they are very friendly there). We were seated and our waitress came and took our drink orders. Allison needed to go to the bathroom, so like a good mom, I took her! Upon coming back to the table I noticed a different waitress that was crouched down by Lydia. Immediately I thought she was causing troubles (as she normally does) and I started in defense mode. However, I stepped back for a second and just observed. This waitress with shoulder length dark hair had a smile (much like mine right now) that span from ear to ear. Her gentle hand was quietly grazing Lydia's delicate skin. I looked over at Lydia and her eyes were completely locked with this waitress and she was smiling and ceasing every ounce of attention this waitress was giving her. I silently stood by my chair, waiting to sit down, but not wanting to disturb this sweet moment. I had no idea why the waitress came over, if Lydia was being her typical self, but it was quite the moment. The waitress asked if Lydia could color and if she could bring something for her. We said yes. When the waitress left I asked my husband if Lydia was disturbing people and that is why the waitress came over. He said no, she just came over and crouched by Lydia and they were talking with one another. My heart leaped and I was overcome with intense emotion of complete gratitude towards this waitress. Throughout the meal the waitress came and got down on Lydia's level and talked with her, encouraged her to eat, and even used her name. I had very little conversation with the waitress other than huge smiles. It was almost as she knew that mealtime was very hard, most days, with Lydia. She would ask Lydia if she could see her eat and immediately Lydia would put a piece of grilled cheese in her mouth and chew, ever taking her eyes off of the waitress. There was some kind of connection there and it was amazing to witness. I am not sure what it was, but it was one of the most beautiful moments. Lydia captures the hearts of many people, she also tends to bother people sometimes to by her loud yelling and her noisy laugh and talking. But this connection was different and was oh so beautiful. When most everyone was done, my husband took Lydia away from the table while the rest of us finished up. I was gathering the leftover food and cleaning up our mess. I looked around for this wonderful waitress but she was no where. I wanted to thank her and tell her how much that meant to me that she just saw my daughter for who she was. She never once commented on her disability or ability. She just saw true beauty in my daughter. As I was walking out I looked up and was surprised that this beautiful waitress was standing in front of me. I was speechless and I just looked at her with tears running down my cheeks and I hugged her. I thanked her, but I was not able to really communicate to her what that meal meant to me. As I approached my husband, I noticed that he too had tears running down his eyes. He looked at me and said that she came all the way out to the entrance just to find Lydia and give her a hug. He said it was such a tender touching moment. After the waitress came to hug Lydia, Ellen said "Next time we come here, I want her for a waitress. She was so nice to Lydia dad and that meant so much to me." My heart was overwhelmed because this waitress genuinely cared. That is not our experience all of the time and it was refreshing. It was refreshing because she never said anything about those beautiful almond shaped eyes, the low lying ears, or how she loved babies with Downs. She never mentioned any of Lydia's differences or strengths. She never commented on her disability at all. She showed a connection out of pure beauty and that was refreshing. Normally we are reminded over and over that she has a disability and they are attracted to her because of this. This beautiful waitress and Lydia had some kind of connection and it was amazing to see. I just wanted to thank this waitress for making my birthday simply amazing. It was such a blessing. God placed an amazing person at the exact right moment once again. Thank you. I just appreciate how you came up and showed such affection towards my daughter in such an amazing way. Thank you Backyard for employing some amazing people. We definitely will be back there and we hope that this amazing waitress can wait on our table. Sometimes we experience moments that take our breath away, and this was one of them. I hope I was able to communicate accurately the beauty in this moment and how much it meant to me! I realize some of you will read this and think that I am nuts for writing these feelings. However, I feel that it is very important for me to write these down and move on from them. We all are battling some kind of challenge. Some may be small and some may be large, but they are all battles of some sort. Comparing our battles to one another does not make sense because we all have a different journey and are battling our own mountains. My mountain that I am battling is the grief that I still struggle with from "losing the child I never had." I know, just in writing that it sounds so silly to be grieving something that I never had. They were thoughts of a perfect child birth, or taking my child out on the town and showing her off, or taking her to play groups and the list goes on and on. It is the grief that I can't experience the same things with Lydia as I enjoyed with my other children. It is the grief of walking a new, unfamiliar path with Lydia. It is the grief in a lost moment that captures my breath and strangles me. It hits me out of nowhere and then leaves me feeling silly for ever feeling that way. I love Lydia with all that I am. I love Lydia and I would not change her for anything. I love the journey that Lydia has taken us on. I love the things that Lydia has taught me. I love the person that I have become because of her. So don't get me wrong, I don't grieve Lydia, I grieve that silly image in my mind of what I thought, I grieve the moments that I don't have. Yet, what I forget, is the things that I do have and that those moments have been replaced with something new (and often times better). These moments for me started the other day when I went to go visit a friend in the hospital who just had a baby. I walked on to the fourth floor infants unit and I was suffocated with these feelings. As I rounded the corner I noticed that she was in the same room that I was for Ellen and Allison's births. I walked into that room and I remembered feeling so alone after I had Lydia. I had no baby, there was no nurse in the room, there was no husband, it was me. Lonely and sad. Arms that longed to hold a baby. Worry that embodied me wondering how my little girl was doing. There she held a perfect little girl. A healthy girl with no tubes or wires. The perfect baby. I was so happy for my friend, but I couldn't help but just be overtaken by sadness. It is something that I can't quite explain. I held her precious girl in my arms and I just felt over joyed but so sadden too. Ellen's first comment was "Hey mom, there are no tubes or wires on this baby." I wanted to scream in frustration but scream in complete happiness. I was completely unprepared for these feelings. I don't want to be selfish and take away anything from my friend and her happiness. But I can't ignore these feelings that completely overtake me. I can't escape these feelings at times. I don't want to feel that way. But I know that part of me will always grieve Lydia's birth. It was just so hard to have her go, it was so hard to watch her endure so much, but we all have been change because of it and we are better because of it. It was HER birth story and it happened just as it was suppose to happen. The other day we took a bike ride. As I was strapping Lydia into her bike buddy a neighbor biked by. She was pregnant at the same time as me. Her son was born just weeks before Lydia was. He was riding a bike. I couldn't even imagine Lydia at that point yet. I was pierced with this sudden grief. I was overtaken with this unwanted feeling. I remember how I felt when my sister said that her son, seven months younger than Lydia was potty trained already. I was so happy for her, I really was. But the grief that over took me was almost too much to bear. I don't expect anyone to understand it, how could they? I don't know what to do with this unwanted grief that seems to just consume me at all the wrong moments. I remember eating dinner with good friends and two of them watch me strap Lydia into her high chair. Lydia was 27 months and I was still feeding her baby food. They made the comment about how they were so glad that they were out of that baby stage. I know that it was not a hurtful comment in any way shape or form. However, the feelings that I felt were numbing to my entire body. I didn't want this baby stage to stay forever either. And at times, I feel like it will never go away. This was not what I intended and that grief consumed me once again. And today, when I had to take the crib out once again for my almost three year old, it was about more than I could handle. Lydia has to sleep in a special bed and she has always been a good sleeper. However, the past several months she has not slept and nor have mommy and daddy. So in sheer exhaustion we decided rigging the crib to keep her "caged" would be our best option. It tore me in pieces. My husband held me and told me that it is not a step backwards but what we needed to do. I agree with him, but I couldn't help the tears and just this overwhelming feeling of grief. I knew that the path would be different, I know that nothing is as I think it should be anyways. However, in these moments that I am completely overtaken by these feelings, I am not sure what to do. I feel so silly for feeling them in the seconds afterwards, but they are real feelings. I am trying to write them down in hopes that I can just put them past me and keep moving forward. We just had Lydia's IEP this past Monday. Everything went as we had expected and it was just fine. In our family we treat Lydia no different than the other girls. We expect the same things from her, within reason (besides how we have to treat her due to her medical needs). So we never focus on the gaps that she may have or how behind she is. She is Lydia and we celebrate her. However, at the IEP we heard things like she was significantly delayed and she was only at a 19 month capacity. I realize that she has to be compared to "something" in order for them to get a baseline for where she is. I get it. But I am torn somewhere in this crazy place of these consuming moments of grief, comparing my child to something that she is not, and accepting her for her. I am sure that this makes sense to nobody but I needed to get this off of my mind. I needed to get real. These moments of grief are real but I am glad that God does not allow me to stay in them. These moments of confusion about this journey and where Lydia is at are real, but again God does not allow me to stay in them. We keep pushing on, loving her with all that we are, learning what God wants us to learn on this incredible journey, giving thanks for where we are at today, and taking things as they come. Not everything on this journey is as beautiful as unicorns farting rainbows, but we survive. This is my journey that I have been called to battle and to live. So I will embrace all of the moments, make the best of what God has given me, and be completely thankful for everything that I have been given. I may not have had that perfect child birth, the journey showing off my child when she was just a couple weeks old, a child that can ride a bike at three years old, a child who is potty trained close to the time that society says is acceptable, a child who can't talk, or a child who cannot sleep in a big girl's bed yet. But what I was given was a journey that would change me from the inside out, a journey that would give me a whole new perspective on things, a journey that allowed me to get to know my child very intimately, a journey that has allowed me to slow down and really embrace every moment, a journey that has made me celebrate every small thing as though it was the largest accomplishment in the world, a journey that catches me by surprise from time to time, and a journey that has taught me how to love through any kind of circumstance. And that my friends, is getting real. I would take the second journey any day over the first!